Here is a truism. The function of a scientific journal is to disseminate the results of research. It also of course has a responsibility to ensure as far as possible that the results reported are valid. But it would seem from the comments of many biologists – sometimes in print [1–3] – that the policing function of journals (especially but not exclusively the high-profile journals) is in danger of overwhelming their primary function as publishers. The chief source of frustration seems to be with increasingly frequent, time-consuming and sometimes iterative re-review which, it is commonly felt, makes little difference to the eventual validity or quality of the paper. For that reason, Journal of Biology will embark, starting now, on an experimental policy of allowing authors to opt out of re-review. This is in keeping with the premise of open-access publishing, of which our publisher, BioMed Central, was the pioneer, that freedom from the practical constraints imposed by paper and printing should remove all needless barriers to access to research results. The decision to launch the experiment was taken after consultation with members of our Editorial Board, who were on balance (by about four to one), and often emphatically, in favor of it. Box 1 contains a highly selective sample of the raw data. 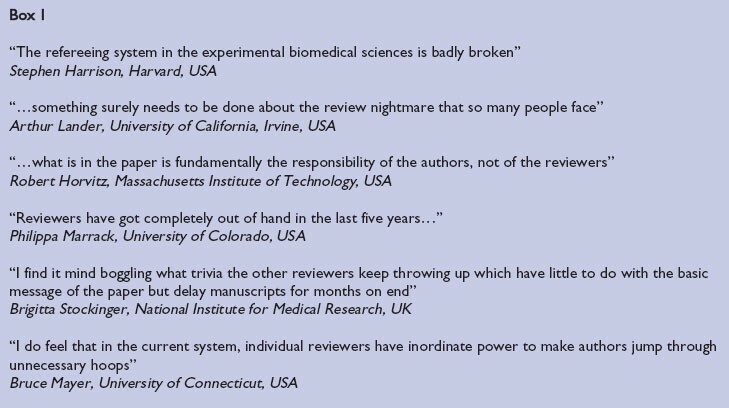 Even those members of the Board who had misgivings (on which more below) often expressed themselves with some passion about difficulties with reviewers: one of the most impassioned of the six we have quoted in fact felt that the need for rigorous review should nonetheless transcend the wish to escape the horrors of current reviewing practice. – Not that we are proposing to abandon review. Briefly, the proposition is as follows. All papers submitted to Journal of Biology will first be screened by a member of our Editorial Board, or an appropriate expert of equivalent sagacity, for suitability in principle for the journal, so that referees are asked to judge only whether the data adequately support the conclusions: this policy is already in operation. If the conclusions are not adequately supported by the data the paper will be rejected. If the paper is deemed perfect as it stands, it will be published without delay (and with an accompanying commentary, as is our normal practice). Where authors opt out of re-review their responses and revised manuscript will be carefully scrutinized by the editorial staff, and if it seems clear to us that substantive issues have not been addressed the manuscript may be rejected. Otherwise it will be published, with an accompanying commentary whose author will have access to the referees' reports and the authors' response. There are obvious problems with this proposition. People may be reluctant to referee papers if they think there is a risk that their careful and important comments may be disregarded: about one in five of our Editorial Board members indicated that this would apply to them. Losing 20% of the possible referees for a paper would be a very serious problem because it is hard enough to find good referees to look at papers quickly as it is. On the other hand, if a substantial number of authors opted out of re-review, this would release more time for the remaining 80%. Seriously flawed papers might find their way into the journal. This of course happens anyway from time to time with most, if not all journals, and probably especially with high-profile journals aspiring to publish particularly newsworthy results. Referees do not always see what turn out to be serious flaws; or, in the case of iterative re-review where the authors cannot come to terms with referees, reviewers sometimes just give up. It is not clear that the end result would be any worse under re-review opt-out. These are the two most egregious potential problems. If I tried to cover all eventualities and contingencies, possible modifications to the present plan, and other strategies for addressing refereeing problems (see for example Biology Direct, also published by BioMed Central: http://www.biology-direct.com/info/about/), this editorial would exceed any reasonable expectation of its readers' patience. A fuller discussion can be found in question-and-answer form on the Blog site: http://blogs.openaccesscentral.com/blogs/bmcblog/entry/q_a_the_re_review; but I will answer here the most important question: since there are clearly other possible ways for editors to resolve the problem of unfairness and iteration in the review process, why take this arguably risky step? If there are no flaws in a paper at the time of submission that should clearly prohibit publication, it seems to us reasonable to leave the authors to decide how much more help they need to make sure that the published paper will not damage their reputation (see Robert Horvitz's remark in Box 1). It is often not clear that the revisions demanded of authors, in particular by the more selective journals, substantially increase their value. When they do, it seems that it is sometimes by insisting on additional data that arguably justify a second paper (see also ), which may have more to do with enhancing the reputation of the journal than with helping the authors to communicate their research. Moreover there are strong arguments against a blanket insistence on absolutely rigorous validation of data (some of them are rehearsed for genome-scale analysis in a comment from Tim Hughes in this issue of Journal of Biology ). This applies especially in the case of genuinely novel research, which is quite likely to raise issues that cannot immediately be resolved. Tim Hunt will not mind if I cite him as having remarked that the paper reporting the discovery of cyclin, the cell-cycle regulatory protein for which he later won (with Paul Nurse and Leland Hartwell) the Nobel Prize in Physiology or Medicine, was messy and flawed in a number of ways. Which is not to say that journals should be recklessly publishing all flawed and messy papers with striking claims in the hope that they will win Nobel prizes. There is no escape from hard judgement calls, for referees and for editors, and we shall not always get it right. The question is whether iterative reviewing materially affects how often we get it wrong. Journal of Biology last published an editorial about itself on the occasion of its fifth birthday . What is new since then? Let me start with what is not new. Our experiment with peer review continues a fine tradition of promoting the interests of authors and to which indeed some have felt moved to testify (see ). A second good thing that hasn't changed is the strong link with our sister journals Genome Biology, BMC Biology and the more specialized journals of the BMC series, any of which may provide a painless route to publication of papers that after review don't quite meet the criteria for publication in Journal of Biology. Meanwhile our major new development is a greatly expanded range of commissioned content. You will find in this issue a brief explanation from James Ferrell, in question-and-answer format, of what systems biology is : this is the first in a series in the same format on topics of current interest or fundamental importance on which readers may feel bemused. As well as our minireviews exploring topics arising from papers published in our sister journals (see for example Whited and Tabin on limb regeneration in this issue ), we shall be publishing full reviews: in this issue, by Peter Moore on the cell's most important ribozyme, the ribosome . We have occasionally in the past published comment: in this issue Tim Hughes sounds off, in a restrained way, about the futility of 'validation' in genomics papers . Although I am new to Journal of Biology as Editor, Penelope Webb, in whose editorial care it has been for the past two years, remains as Consulting Editor, and Elizabeth Moylan as Deputy Editor, to help uphold the journal's honorable tradition of friendliness and courtesy to authors. New to the journal since its fifth birthday are Sandra Le (Senior Editor), who has built the minireview series, and Elizabeth Benson (Assistant Editor) who has just joined us. Penelope and Elizabeth Moylan in particular embody the blood ties to our sibling journals in the BMC series.